The Colorado School Library Survey is administered each year by the Library Research Service, an office of the Colorado State Library. All traditional K-12 public educational institutions in Colorado are invited to participate. This report highlights results from the 2015-16 Colorado School Library Survey, which had a 37% response rate. In 2008, the Library Research Service launched a longitudinal study to document the use of various web technologies on the websites of public libraries throughout the U.S. The study was repeated in 2010, 2012, and 2014, expanding on the 2008 findings by tracking the trends in U.S. public libraries over time as well as by examining new technologies as they emerged. Highlights from the Colorado portion of the 2014 study are presented below. Want to know more? Check out the complete report at http://bit.ly/LRS_webtech. The Colorado School Library Survey is administered each year by the Library Research Service, an office of the Colorado State Library. Surveys are sent to traditional K-12 public educational institutions. Statewide estimates are produced by weighting survey data to reflect the universe of school libraries in Colorado. Survey responses are totals based on results from the school library staff who participated in the survey. 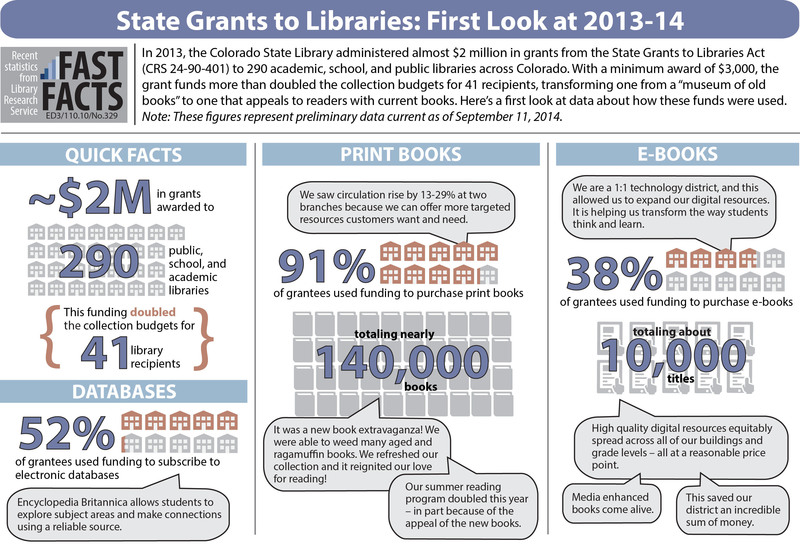 This report highlights results from the 2013-14 Colorado School Library Survey. The Colorado School Library Survey is administered each year by the Library Research Service, an office of the Colorado State Library. Surveys are sent to traditional K-12 public educational institutions. Statewide estimates are produced by weighting survey data to reflect the universe of school libraries in Colorado. Survey responses are totals based on results from the school library staff who participated in the survey. 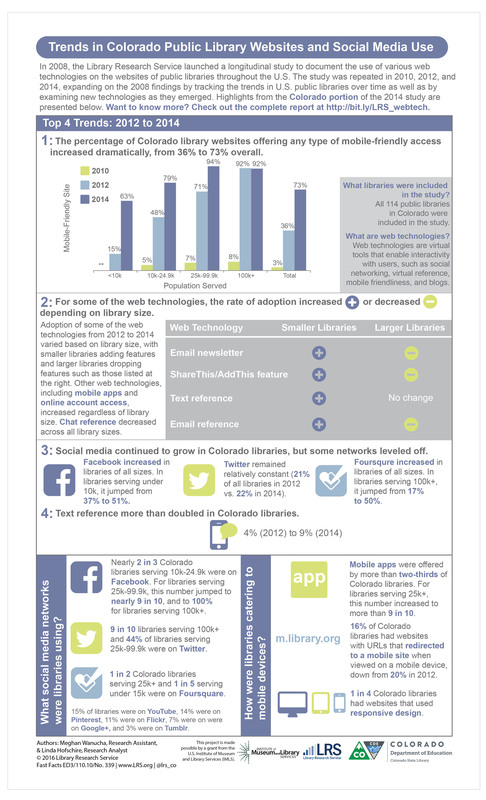 This report highlights results from the 2012-13 Colorado School Library Survey. This Fast Facts presents data summarizing equipment installation, digital literacy efforts, and computer use in Colorado during the two-year Broadband Technology Opportunity Program (BTOP) grant project, from April 2011 to March 2013. For more insight into the project, visit www.lrs.org/btop-evaluation and read previous Fast Facts covering class participant satisfaction survey results and workforce efforts and partnerships, as well as an outcome evaluation report. PDF version of this infographic. more than 4 in 5 (85%) of those serving LSA populations less than 10,000 (up from 79% in 2010). Technologies that increased from 2010 to 2012 included: online library card sign up (9% to 17%), online account access (75% to 80%), email newsletter (18% to 27%), AddThis/ShareThis interface (18% to 24%), chat reference (59% to 67%), and text reference (1% to 4%). Technologies that decreased included blogs (21% to 15%) and email reference (25% to 22%). However, these trends varied depending on the library’s LSA population. The smallest libraries increased their adoption of many of the web technologies, with the exceptions of blogs (12% to 5%), AddThis/ShareThis interface (15% to 11%), and email reference (13% to 5%). The largest libraries decreased their use of online account access (100% to 92%), non-blog RSS feeds (67% to 58%), and chat reference (100% to 75%), while showing the biggest gains in online library card sign up (33% to 67%), AddThis/ShareThis interface (33% to 75%), and text reference (0% to 25%). Almost all (92%) of the largest libraries, close to three-fourths (71%) of libraries serving between 25,000 and 99,999, more than half (57%) of those serving 10,000 to 24,999, and 40 percent of the smallest libraries had at least one social media account. 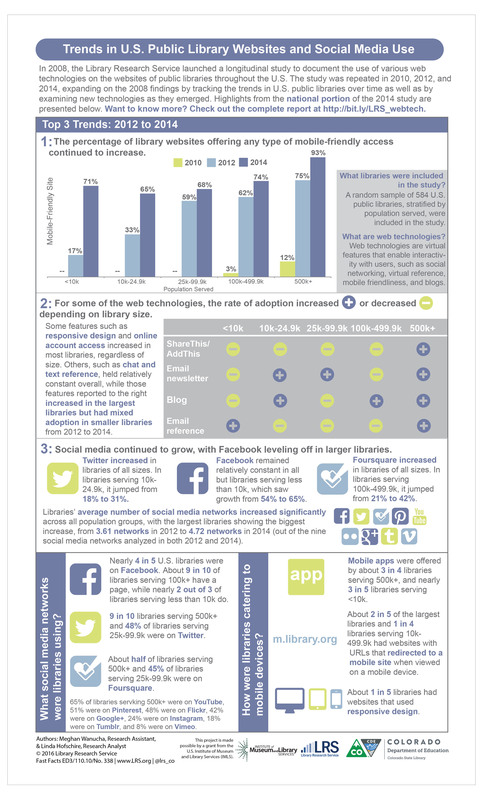 Of the 9 social networks that were analyzed, libraries were most likely to be on Facebook (51%). From 2010 to 2012, libraries serving 25,000-99,999 had the biggest jump in adoption of this social network, from 36 percent to 71 percent. 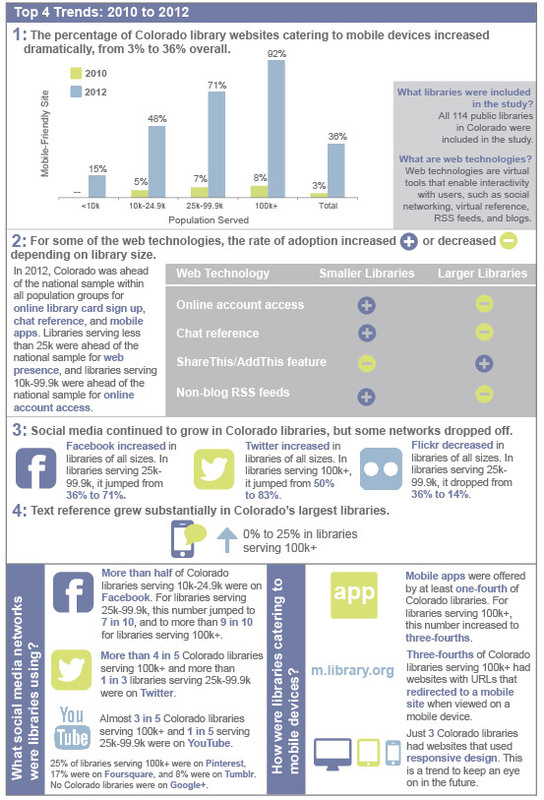 About 1 in 5 (21%) Colorado public libraries were on Twitter and 1 in 10 were on YouTube or Flickr. However, Flickr decreased in all population groups; for example, 36 percent of libraries serving 25,000-99,999 used this social network in 2010 versus 14 percent in 2012. One-fourth of the largest libraries were on Pinterest, 17 percent each were on Foursquare and Vimeo, and 8 percent were on Tumblr. The largest libraries were on an average of 3.50 social networks out of the 9 included in the analysis, whereas the smallest libraries averaged less than 1. 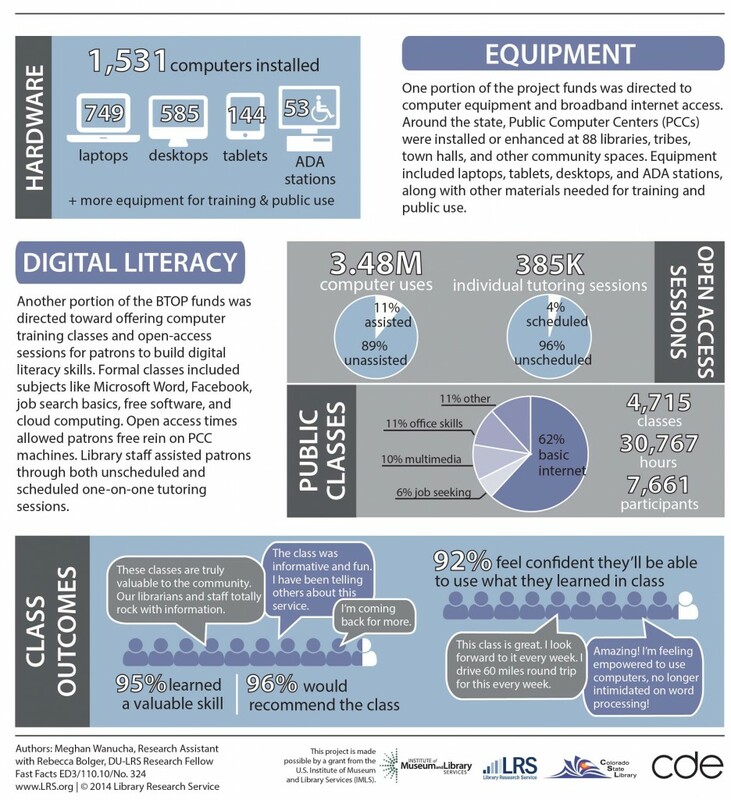 More than 9 in 10 (92%) of the largest libraries, 71 percent of libraries serving between 25,000 and 99,999, nearly half (48%) of libraries serving between 10,000 and 24,999, and 15 percent of the smallest libraries offered some type of mobile-friendly website access. 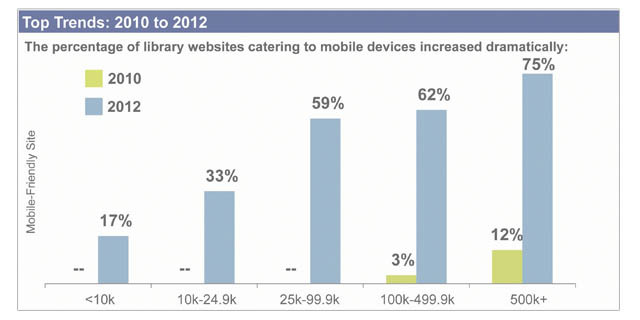 just 3 libraries used responsive design. PDF version of this Fast Facts. Closer Look report, which contains detailed information about the national and Colorado-specific findings. 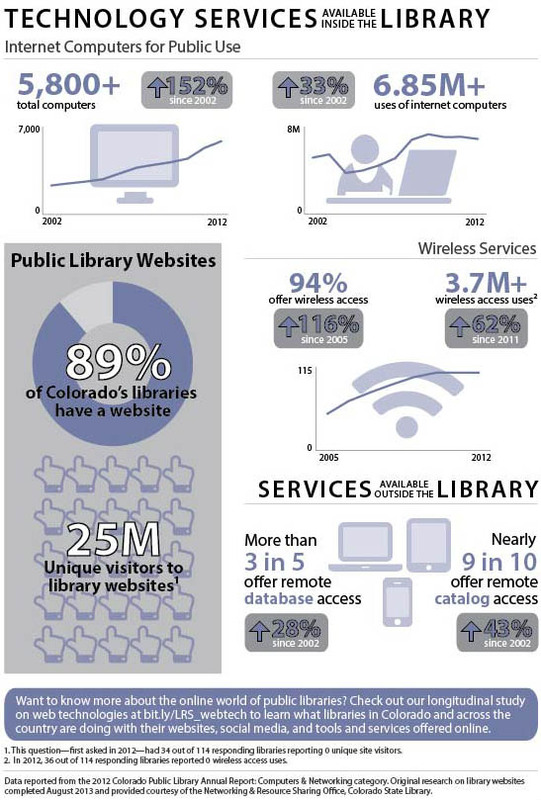 U.S. Public Libraries and the Use of Web Technologies webpage, which contains all published information from the 2008, 2010, and 2012 studies. a little more than 4 in 5 (83%) of those serving LSA populations less than 10,000 (up from 71% in 2010). Generally, the biggest increases in terms of adoption of these features occurred in the smallest libraries. This was true for online account access (45% in 2010 vs. 70% in 2012), blogs (6% vs. 10%), RSS feeds (10% vs. 20%), and catalog search boxes (14% vs. 25%). In contrast, in larger libraries, many of these features either remained relatively constant or declined from 2010 to 2012. One notable exception was text reference, which increased from 13 percent to 43 percent in libraries serving more than 500,000. In most libraries, regardless of size, ShareThis/AddThis features increased, email newsletters and online library card sign up held relatively constant, and chat reference dropped from 2010 to 2012. Almost all (93%) of the largest libraries, a little more than 4 in 5 (83%) libraries serving between 25,000 and 499,999, 7 in 10 (69%) of those serving 10,000 to 24,999, and 54 percent of the smallest libraries had at least one social media account. Of the 9 social networks that were analyzed, libraries were most likely to be on Facebook (93% of the largest libraries, 82% of libraries serving between 25,000 and 499,999, 68% of libraries serving between 10,000 and 24,999, and 54% of the smallest libraries). From 2010 to 2012, the smallest libraries had the biggest jump in adoption of this social network, from 18 percent to 54 percent. Other common social networks were Twitter (84% of the largest libraries were on this network) and YouTube (60% of the largest libraries). Flickr was also common, however, it has decreased in all population groups from 2010 to 2012; for example, 63 percent of the largest libraries used this social network in 2010 versus 42 percent in 2012. Close to one-third (31%) of the largest libraries were on Foursquare, 23% were on Pinterest, and 8 percent each were on Google+ and Tumblr. The largest libraries were on an average of 3.54 social networks out of the 9 included in the analysis, whereas the smallest libraries averaged less than 1. Three-fourths of the largest libraries, about 3 in 5 libraries serving between 25,000 and 499,999, one-third of libraries serving between 10,000 and 24,999, and 17 percent of the smallest libraries offered some type of mobile-friendly website access. In contrast, in 2010, 12 percent of the largest libraries, 3 percent of libraries serving between 100,000-499,999, and no libraries serving less than 100,000 offered mobile-friendly website access. just 9 libraries used responsive design.